I just want to filter select field in a form, regarding a currently logged user. Every user has own categories and budgets. I want to display only a models related with a currently logged user. I’ve tried stuff with filtering before is_valid field, but with no result. This is a very common use case when dealing with ModelForms. The problem is that in the form fields ModelChoice and ModelMultipleChoiceField, which are used respectively for the model fields ForeignKey and ManyToManyField, it defaults the queryset to the Model.objects.all(). If the filtering was static, you could simply pass a filtered queryset in the form definition, like Model.objects.filter(status='pending'). When the filtering parameter is dynamic, we need to do a few tweaks in the form to get the right queryset. Let’s simplify the scenario a little bit. 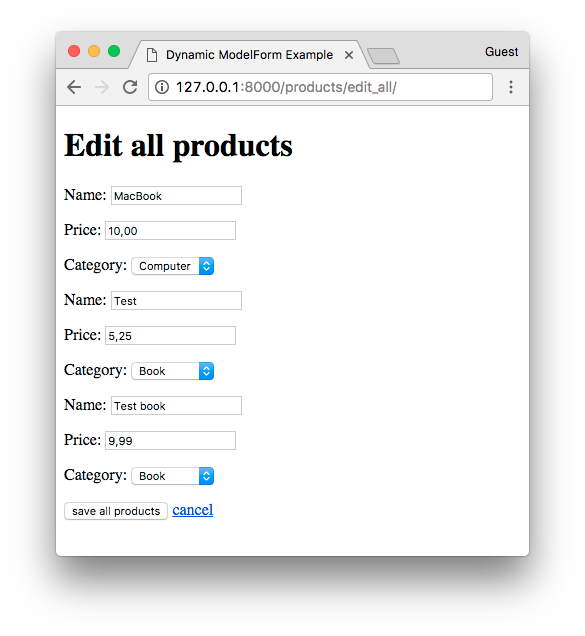 We have the Django User model, a Category model and Product model. Now let’s say it’s a multi-user application. And each user can only see the products they create, and naturally only use the categories they own. That means now the ProductForm has a mandatory parameter in its constructor. So, instead of initializing the form as form = ProductForm(), you need to pass a user instance: form = ProductForm(user). The machinery behind the modelformset_factory is not very flexible, so we can’t add extra parameters in the form constructor. But we certainly can play with the available resources. The difference here is that we will need to change the queryset on the fly. The idea here is to provide a screen where the user can edit all his products at once. The product form involves handling a list of categories. So for each form in the formset, we need to override the queryset with the proper list of values. The big difference here is that each of the categories list is filtered by the categories of the logged in user. I prepared a very detailed example you can explore to get more insights.